Caroline and I support each other in our individual endeavors when we can and today I was in her Get Fit Class Series in Wellington, Colorado. It’s a wonderful 45 minute class where we functionally move to create body awareness, strength and stamina. It’s always a great class, but today she reminded us all to be playful and to find that childlike spirit again where EVERYTHING is fun and you don’t have a care in the world about what other people may think of your “silliness”! Well, it didn’t take me long to totally adopt that mentality. All of the sudden, I had the permission to be like my 8 year old self — carefree, dorky, vibrant, a little spazzy and full of creativity. I was enjoying my experience, even as I was doing the things that would normally be accompanied by a groan or a complaint. All it took today, was a mindset shift in the direction of play and I was IN! I began to move in new ways (& still maintain good form, right Caroline?) and even came up with what we’re now calling the Praying Mantis Crawl! We can’t wait to share this one with all of you. It is an absolute blast. From there, I decided to adopt this mantra in all that I do today AND in all that I do from here on out. You know, there’s really no reason that we can’t have fun in each activity that we do — even those we have previously deemed tedious, boring, difficult, frustrating, etc. If we change the thoughts behind what we do, the things we do will change! What do you think? Will you LET YOURSELF GO? Have a beautiful and playful day, my lovely humans! P.S. If you want to come play with us, set up your FREE 30-minute power-session to find out more about how we can work together! 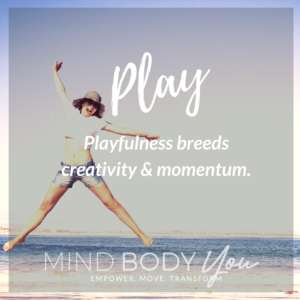 You can also check out our upcoming 6 Week Mind Body You Program that starts May 7-June 15 OR join us this Friday for Momentum at 6 am to get a feel for bringing play to your life through fitness, yoga & mindset.